Researchers at the Astrobiology Center (ABC) of National Institutes of Natural Science (NINS) in Japan and their colleagues have proposed that Earth-like red-edge reflection patterns could be observed on exoplanets around M-dwarfs. They point out that the first oxygenic phototrophs are most likely to have evolved underwater to utilize visible light, as occurred in the primordial ocean on Earth. M-dwarfs or red dwarfs are small (0.5-0.1 solar-masses) and cool ( ~3000 Kelvin) stars, and are abundant in universe. The sun-like stars are considered plausible targets for searching habitable exoplanets. However, nearby M-dwarfs are becoming the most extensive targets for habitable planet searches because they are the most abundant nearby stars and thus could be the first candidate for detecting biosignatures on exoplanets via transit or direct imaging observations in near future. One of the most important exoplanetary biosignatures is a specific reflection pattern on the land surface called "red-edge," which is caused by vegetation such as forests and grasslands. On the Earth, red-edge appears between red and infrared (IR) wavelengths, since red light is absorbed for photosynthesis while IR radiation is reflected. In previous studies, it was predicted that red-edge position on exoplanets should be decided by the radiation spectrum of nearby stars. Around M-dwarfs, red-edge was expected to be shifted to a longer wavelength, since planets on the exoplanets use abundant IR radiation for photosynthesis. 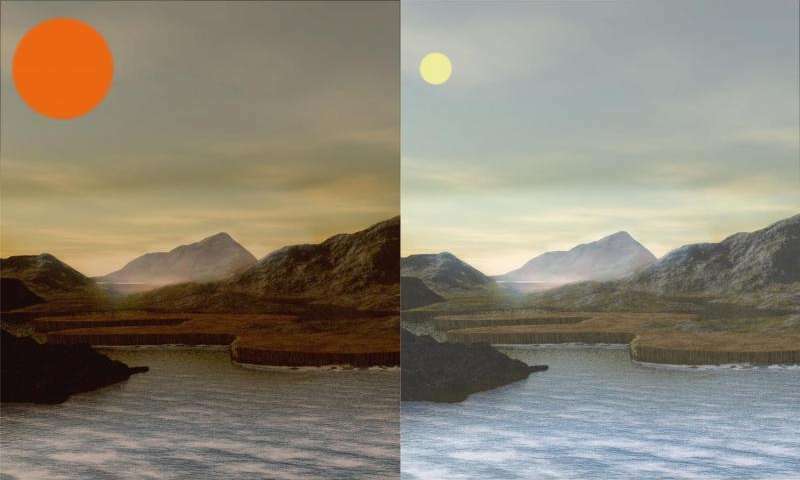 Researchers at the Astrobiology Center (ABC) of National Institutes of Natural Science (NINS) and their colleagues have proposed an alternative prediction that red-edge could be observed as on the Earth even on exoplanets around M-dwarfs in the online journal Scientific Reports. They point out that the first oxygenic phototrophs are most likely to have evolved underwater to utilize visible light just as in the primordial ocean on the Earth. They examined light adaptation mechanisms of visible and IR radiation-using phototrophs required for adapting to land habitats and found that IR-using phototrophs struggle to adapt to changing light condition at the boundary of water and land. Kenji Takizawa, read author of the study, said "It is too risky to utilize IR-radiation during water-to-land evolution."